Kristi and Tony Savage from TN. came down to see what all the rage is about with these Okeechobee Large mouth and they definitely didn’t disappoint. These guys caught 30 fish in under 4 hrs. on only 5 dozen Wild shiners. TN. is one of my favorite states in all of the U.S so we spent time talking about the mountains the fires and of course Dolly Wood. Tony spends a lot of time on the water he hasn’t however had a day where he caught so many bass in a day in hos life he said. 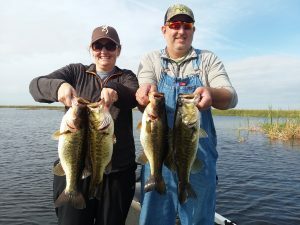 Over all it was a wonderful day meeting these two and catching plenty of Okeechobee Large Mouth Bass.